At the dawn of long-distance air travel only the very brave dared to cross something as vast as the Atlantic Ocean. 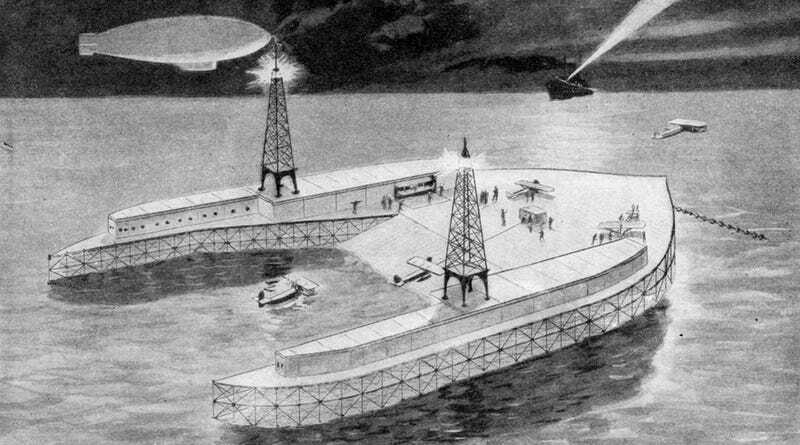 If crisscrossing the globe by air was going to come to the masses, some people believed it would have to be helped along by some new innovations—like these artificial islands of the future, courtesy of 1927. By the late 1920s, men like Charles Lindbergh, Clarence Chamberlin and Richard Byrd had crossed the Atlantic in that daredevil's pursuit of glory. But air travel for John and Jane Q. Public wasn't ready for primetime. Gimmicks like in-flight movies may have been taking off in that decade, but crossing giant bodies of water was still considered very dangerous thanks to the limited fuel and weight capacity of aircraft at the time. Artists, aviators, and amateurs who were thinking about these problems devised a plan for a series of artificial islands that could be used to hop across the Atlantic's vast expanse. These weren't the artificial islands of every techno-libertarian's dreams, which looked something like sovereign nations. No, they were essentially way-stations—jumping off points that would allow aeroplanes and dirigibles to fuel up and safely perform maintenance if necessary. The September 1927 issue of Science and Invention magazine included the illustration above of just such an artificial island. As the magazine describes it, "this type of a vessel is floated by immense double pontoons, the inner compartments of which contain the gasoline, while the outer is the buoyant body." The difficulty of building something like this at sea was in creating a structure that could withstand the tremendous waves. An inventor named Giuseppe Pino patented the concept above, which was supposed to solve this problem. It consists of a large vessel probably a thousand feet long, built so as to withstand the terrific pounding of the most violent waves. Not only should the structure hold up under this incessant barrage, but it must be so constructed that the deck will not rise and fall with the waves, enabling the aviator to be sure of his landing field and not level out for landing as the field drops away 30 feet beneath him. The structure mounted on large floats is quite capable of doing this and even severe storms produce no undulating motion of the island the inventor claims. The idea wasn't altogether crazy. For instance, the Johnston Atoll was established in 1935 as a seaplane base. Southwest of Hawaii, the site allowed the American military a place to refuel. While not wholly an artificial island, the landscape was heavily altered (by dredging up the surrounding lagoons and building larger islands) to provide a jumping off point. It was closed off for military plane purposes in 2004. Improvements in the airplanes themselves would make these artificial islands dreamed up in the 1920s largely unnecessary. But it's not hard to imagine an alternate reality where the world's oceans are dotted with giant platforms where hundreds of dirigibles can park for a quick refueling. Impractical, of course, but the retrofuture often appears that way with the benefit of historical hindsight.